The Map theme uses a professionally done watercolor illustration of the campus as its default background. 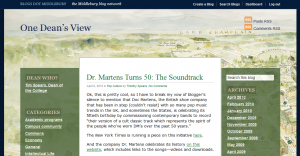 This theme has a sidebar on the left of the blog’s content. Because of this positioning, both columns appear on all views of the blog, even when viewing a single post. Use this theme if you really like columns! This theme also lets you change the background image.